1. Do not glaze ham right away! First, place the unglazed ham in a large roasting pan (I actually used my cast iron skillet because my roasting pan was too small) and bake in a preheated 325˚ oven and for 3 and a half hours. Remove ham and apply glaze 30 minutes prior to it being done. The ham should cook for a total of 4 hours or until an internal temperature of 140˚ is reached. 2. 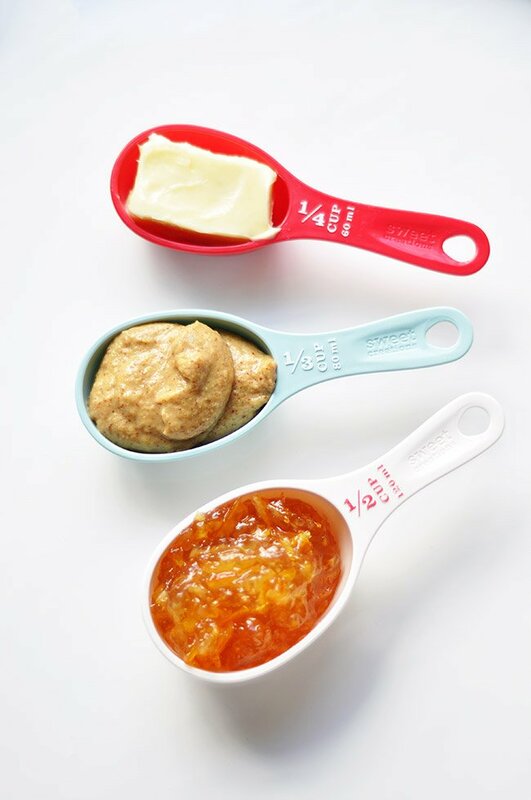 To prepare glaze: In a bowl, using a fork, mix together the orange marmalade, dijon mustard and room-temperature butter. Spread the glaze over the entire surface of the ham and return to the oven for 30 minutes. Warning: Ham may be hot to touch so use a spatula to spread the glaze. Note: You may want to make an additional batch of the glaze and serve it as a spread! 3. Slice pomegranate in half and squeeze to loosen seeds (or better yet, buy a cup of pomegranate seeds if your grocery store carries them that way). 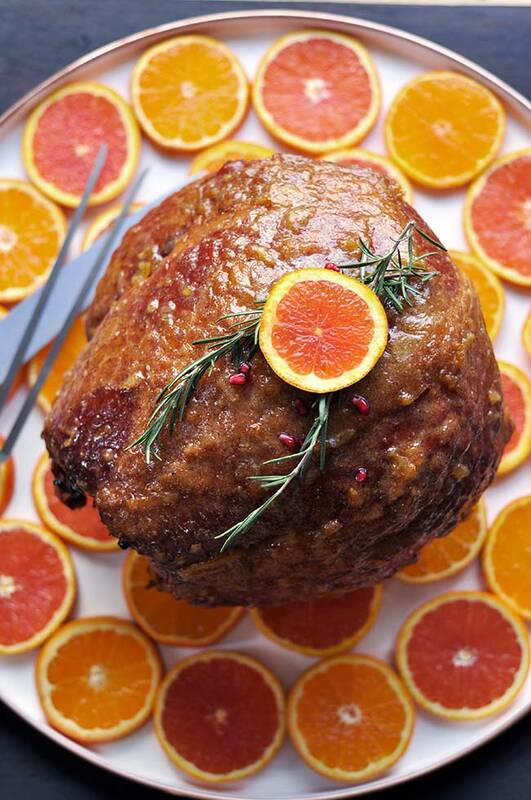 Use as garnish along with fresh rosemary and place you ham on a bed of orange slices right before serving. As much as I love the combination of pineapples and ham (hello, favorite pizza toppings), I decided we need to branch out of the 70s and reinvent the centerpiece ham. It’s time, folks. 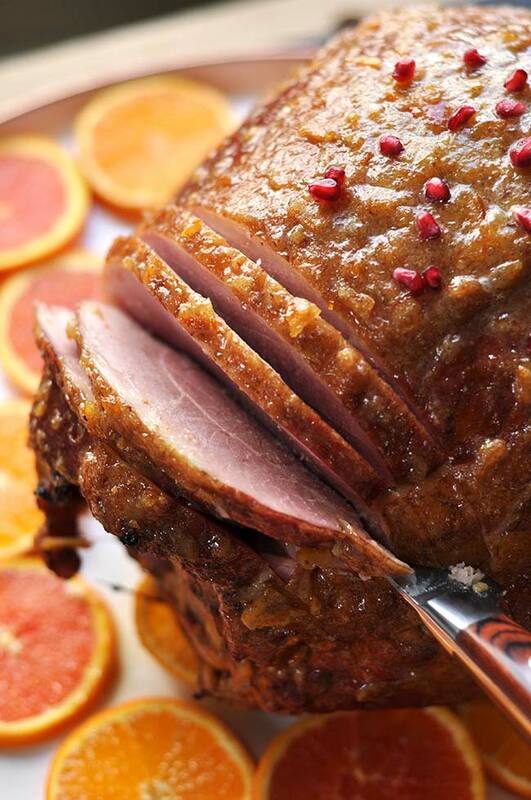 This Orange Marmalde Glazed ham is moving in. For years we’ve been scoring patterns into our hams, poking them with cloves, donning them with pineapple slices and maraschino cherries and otherwise dressing them up in silly ways to make them worthy of centerpiece status. I kind of think that because hams are already cooked and we’re essentially just slowly heating them up rather than actually cooking them, we feel some sort of obligation to put in additional effort in order to do this main course justice. Fine. I get it. I’m on board with decorating them! I love to decorate. But, can we please move past the pineapples and cherries? I’m not going all modern on you, suggesting that you froth your ham or put it in an edible bubble. To me, modern is simple and new but carries with it a bit of the past. So, in a nutshell, that’s how the idea of this orange marmalade glaze came to be. Old-fashioned, citrusy-sweet, orange marmalade mixed with dijon mustard for tang and butter for creaminess makes a super simple and delicious glaze and spread. Did you catch that the glaze is only three ingredients?! Modern simplicity right there. 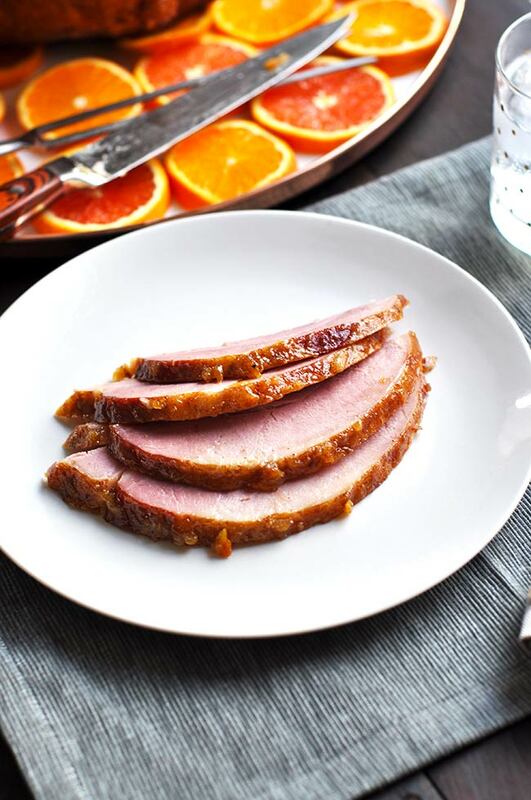 And oranges = a new and refreshing way to complement a savory, smokey ham. 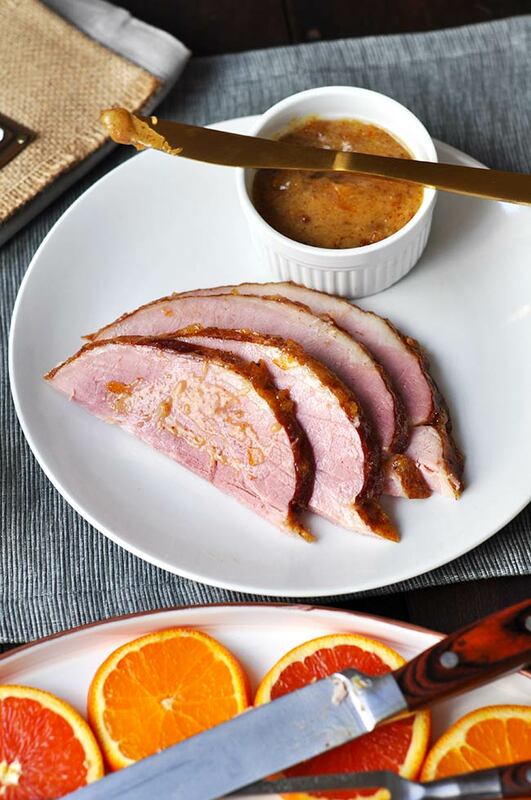 The beauty of using orange marmalade is that you can justifiably lay your ham on top of a bed of orange slices and voila! You have just added that special centerpiece-worthy touch to your main course. Your family will ooh and ah over how lovely it looks and dinner becomes a little more special. I think we can all agree, nothing says family like a big, beautiful ham on the table. Just please do me a favor, put the pineapples down and try some oranges for a change. 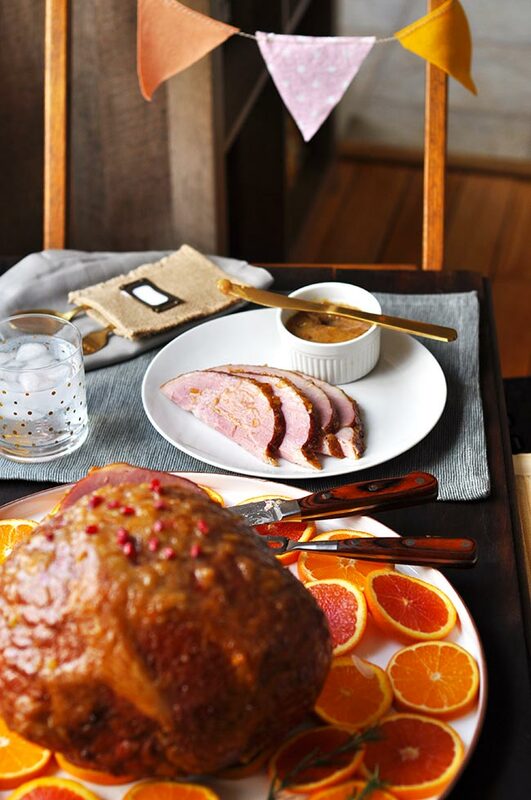 Carving – If you’re not sure how to carve a whole (or semi-boneless ham in this case), don’t worry. It’s not that hard to carve a ham. If you’re a bit rusty or never carved a ham before then check out my tutorial, How to Carve a Whole Ham. I break down how to carve a ham, step by step with photos and featured is the same Smith’s semi-boneless ham used to make this recipe. Creating a Bed of Orange Slices – Try using a mandoline slicer to get your slices nice and smooth. It’s not necessary, but as you can see if you look closely I did not use one and my husband lovingly pointed out that I should have, ha! Known for their natural-casing hot dogs, Smith’s may not be top-of-mind when it comes to hams. But they certainly should be. Their hams are smoked for 12 hours over fresh-cut, sugar-maple hardwood embers (no liquid smoke); and cured with a brine recipe developed four generations ago, seasoned with only fresh, natural, never-frozen herbs and spices. Smith’s hams are naturally moist, no water added, which makes the flavor really stand out. If your ham leaks a bunch of water when you open it, not a good sign! Smith’s hams do not come pre-cut or pre-glazed. This allows you to choose your own glaze and cut the ham as you are ready to eat it, better preserving its freshness and moisture. Smith’s hams are also gluten-free. It’s been said that a Smith’s ham is the “very best ham you’ll ever eat” and in my own opinion, I’d have to agree. You get what you pay for when it comes to hams but be sure you’re paying for quality ingredients and cooking methods and not gimmicky extras like spiral cuts or glazes. Connect with Smith’s on Facebook: facebook.com/smithshotdogs and on Instagram: instagram.com/smithshotdogs and visit the Smith’s website to order your holiday ham. To get your ham before Easter, be sure to order by the 1st week in April. If you’re located in the tri-state area, you can finds Smith’s hams at your local grocer or chain retailer. Visit the Smith’s site site for a complete list of locations. 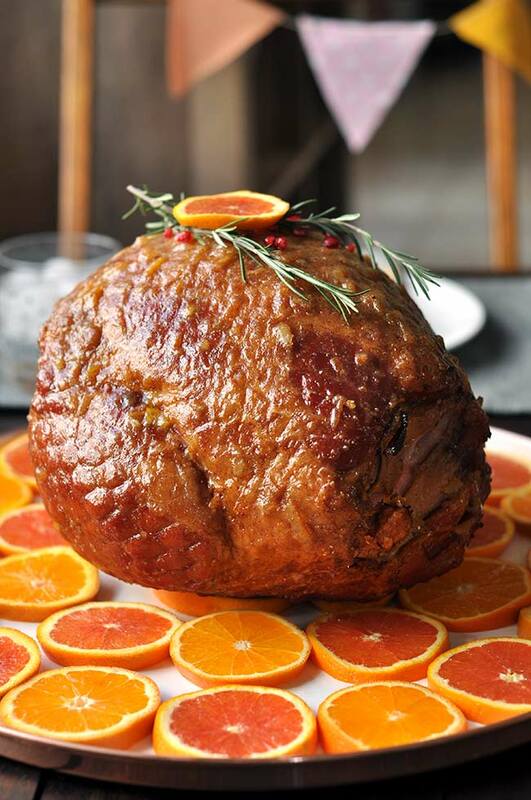 Making this ham for a holiday? Check out my other holiday recipes! this glaze makes an already amazing smith’s ham even more amazing. wow.